If you've tried to create your own funny awards, you know the hardest part of the process is coming up with award ideas, categories, titles, or funny award names. Wouldn't it be great to have a list of funny award names written by some of the best professional comedians working today? Well, you're in the right place. 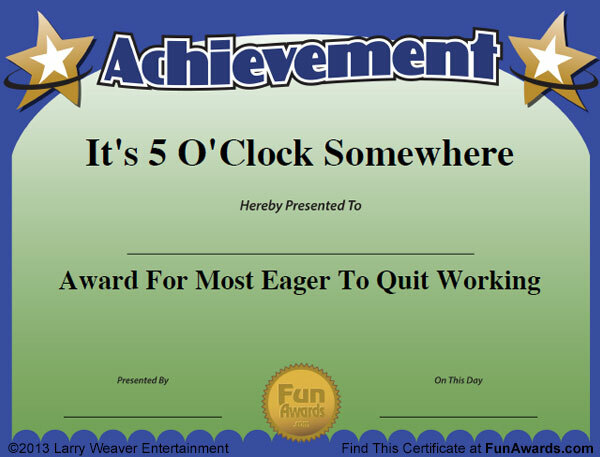 FunAwards.com is your best source for funny awards for employees, teachers, students, the office, kids, sports - whatever the occasion! Our funny certificates were written by an A-List writing team consisting of professional touring comedians, a features writer from the New York Post, and an Emmy nominated writer from Saturday Night Live! They are perfect for any company, organization, or group! Got an idea for funny awards names you'd like to see in 2011? Let us know in the comments section!